I arrived in Atlanta last weekend to what felt like unprecedented heat and humidity. Like hunger, you’re not yourself when you’re sweating like a Thanksgiving turkey in a 350-degree oven. While waiting for my shuttle to the hotel, a driver for another hotel shuttle service tried to make small talk. Like Ralphie in A Christmas Story waiting in line for Santa, I had no time for chitchat when all I wanted was for my shuttle to show up and deliver me from the tyranny of this suffocating heat. The shuttle pulled up and I hopped my eager little legs inside with one big step. The gentleman driving asked what brought me to town. He thought I was a college student. Free from the torture of the heat, I cracked a smile. “I’m here for the NFL moms conference,” I said reluctantly. Not because I wasn’t excited. I just didn’t feel like answering follow-up questions. The heat and humidity still had a hold on my personality. “You don’t look like you got a son in the league. My son played in the NFL too,” he said with pride as he shut the door on the humidity. I really wanted to engage him, but I was still too hot. So I listened to him share how his son was an undrafted free agent from a small school who played a few years in the league and now coaches. He asked my son’s name and team and asked me about the NFL moms conference. I told him this was my first conference so this is all new to me. We soon reached the Westin Airport Hotel. He opened the shuttle door and, like a crazed Eagles fan, the heat and humidity were there to curse my curls and my comfort. I said my goodbye to a fellow NFL parent and proceeded to check in. My roommate for the weekend, Dawn Elliott, mother of Dallas Cowboys running back Ezekiel Elliott, wasn’t set to arrive for hours. I checked in, dropped my bag and texted my contact Deanna Moore, the Professional Football Players Mothers Association’s chairwoman. She texted to wait outside of the board meeting and she’ll meet with me after the meeting. 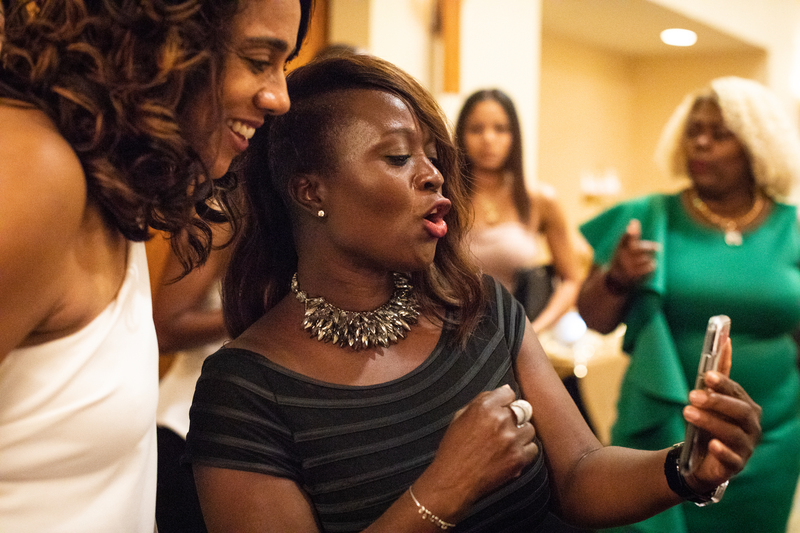 Dawn Elliott (left), mother of Ezekiel Elliott, and Annie Apple, mother of Eli Apple, FaceTime with Eli during the annual Professional Football Players Mothers Association meeting at Westin Atlanta Airport on July 14. As I sat waiting, I watched the ladies of the Professional Football Players Mothers Association, PFPMA (pronounced Piff-Mah) interact gleefully with one another. I felt like the new cousin at a family reunion. I ran into an older woman who laughed easily. I introduced myself to her. She was Gladys Bettis, and she shared some funny stories about her youngest son, Pittsburgh Steelers Hall of Fame running back Jerome Bettis, including the one about her wanting Jerome to become a professional bowler and not a football player. Mama Bettis, as she’s affectionately called, also shared that Jerome played with asthma and how her concern for his health made her sit in the parking lot at his high school practices. Soon, Moore came out to greet me. She’s tall and beautiful with an obedient silver bun. Her voice is soothing, the kind that will calm you in a storm and convince you cauliflower is chocolate. The mother of four sons — including Kyle Moore, drafted in 2009 by the Tampa Bay Bucs — is also a speech language pathologist, life coach and best-selling author. She’s the chairwoman for the PFPMA conference, a position she takes seriously, and is fully committed to this organization that guides mothers, grandmothers and foster mothers of NFL players. Now in its 21st year, the PFPMA was founded by a group of influential NFL moms who have led this organization, including Bettis, Donna George (Eddie George), Wilma Char McNabb (Donovan McNabb) and Denise Wayne (Reggie Wayne). While the founders set the groundwork, today’s moms have continued to push the organization forward, including its current vice president Gwendolyn Jenkins, mother of Philadelphia Eagles cornerback and Super Bowl champ Malcolm Jenkins. “It’s a great organization of women who understand your walk. That’s something even your best friend can’t relate to, some of the things and experiences that another NFL mom that’s been through it can,” said Jenkins, a graduate of North Carolina A&T State University and CEO of The Malcolm Jenkins Foundation. Left to right: Charlene Carter, mother of Kyle Carter; Tracie Robinson, mother of Allen Robinson. Entering my third year in the NFL, I’d just joined PFPMA at the behest of my friend and fellow Buckeye mom Betty Roby, mother of Denver Broncos Super Bowl champ Bradley Roby. I’d heard of the organization when the New York Giants drafted my son Eli Apple in 2016, but when you come into the NFL you’re focused on getting your son settled into his new life and responsibilities. I soon learned that joining this sisterhood of moms is one of the most important things an NFL mother can do. I sat with a few ladies to learn more about this group filled with rookie moms, veteran moms and Hall of Fame moms and their journeys in the NFL. For many of these women, PFPMA is a compass that guides them through every stage of NFL life. 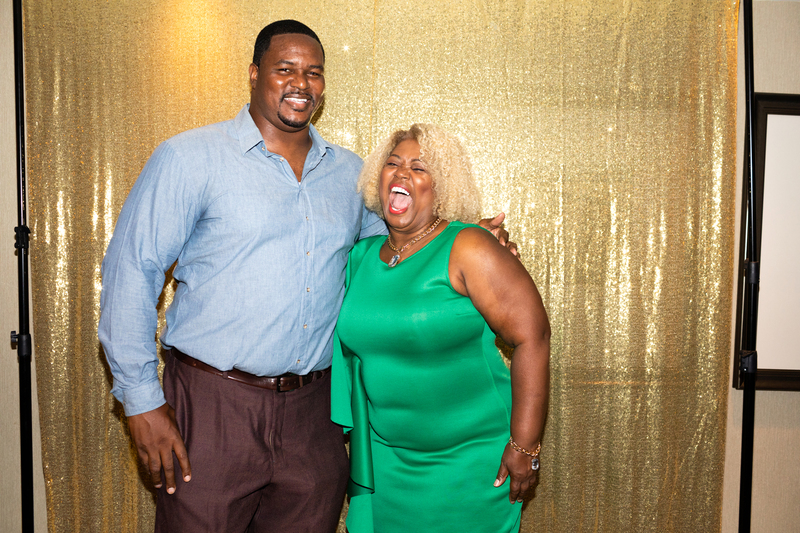 Some moms who joined years into their sons’ career wished they’d done so sooner, including Michelle Green, current PFPMA president and mother to former Ravens Super Bowl offensive tackle Bryant McKinnie. “I wish I had someone to help me through the process,” she said. “It was trial and error. It was hard. I had to learn. I made mistakes because I didn’t know. I just wish I had guidance to help me. I was a young mom in the league, so what do I do? I went, I had a good time, I enjoyed that life. But what I should’ve done in this 12-year span was continue my education, because I gave up my life for his life,” said Green, who has gone back to college and is in her last year at Liberty University. Sandra Atkins’ husband, Gene Atkins, played with the Saints, and her son, Geno Atkins, now plays for the Bengals. Getting the men in her life to see football as a business and not just a brotherhood wasn’t easy. Left to right: Chris Johnson, mother of Larry Johnson; Deanna Moore, mother of Kyle Moore. Injuries are a reality of that business. All NFL moms know that our son’s retirement is one football play away. Every mom at the conference had been touched by injury, if not directly then from another mom because we all are so connected. And nothing connects us more than watching one of our own get carted off the field into uncertainty. When injuries force players to retire as young as in their 20s, it leaves an NFL mom with the burdensome task of, first, helping her son get used to no longer doing what he’s done his entire life and, second, helping him to discover other dreams and passions. Valynne Williams, a school teacher from Austin, Texas, is going through this. Her son, former Buffalo Bills safety Aaron Williams, is retired at age 28 after concussions and neck surgery. Williams said she deals with the fear of CTE through prayer and being proactive by making sure her son gets the help he needs and stays in contact with his peers who have gone through it. She also gets much-needed support from her NFL moms community. For others, PFPMA is more than just an organization. It’s a lifesaver. No one knows this to be true more than Mama Bettis. Michelle Green with her son Bryant McKinnie. According to Bettis, Donna George and son Eddie decided to have a weight loss challenge for the NFL moms. “He taught us how to eat right, taught us how to exercise. They took us to Tennessee. They bought us tennis shoes and showed us how to cook and make different food choices. We saw doctors. And during that time, they found out that I had a blockage. I had a 100 percent blockage of my artery and had to have a bypass. I had a five-vessel surgery, and it was because of PFPMA,” said Mama Bettis, who now advocates for women’s health and wellness. As tremendous a resource as PFPMA is, its current membership is just 109 with only one non-black member. Out of 32 teams, PFPMA does not have a rep from the Browns, Texans, Packers, Saints, Rams and, until recently, the Giants. So why the low membership? The insights and strength gained just over a couple of days have given me the focus I need to embrace another NFL season. I, along with other new members, came away with words of wisdom from mothers who’ve been where we are, even moms who’ve been to Canton and back.